Summer is fast approaching that means dusting off the grill and grilling all your favorite honey recipes! To optimize your outdoor grilling experience, use these secrets when grilling with nature’s versatile go-to sweetener: honey. Click here for delicious honey inspired grilling recipes. 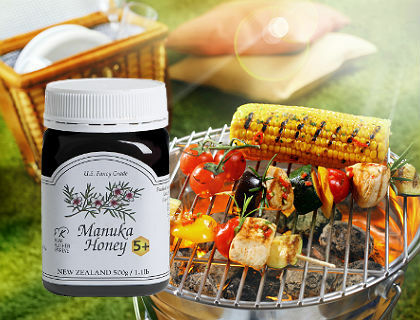 Handling honey & honey marinades: To keep the honey flowing easily, run honey jar through hot water, keeping the jar upside down. This also applies to marinades made with honey since they tend to be thick. Marinade in a bag: Mix your honey marinade right in a plastic food storage bag. Add the meat and the marinade to the bag and toss a bit to mix. When the ingredients are marinating in the plastic bag, make sure you toss the meat so all sides get evenly marinated. Then refrigerate. Time it: Fish and vegetables absorb flavors quickly; they marinate in 30 to 40 minutes. Chicken can go anywhere from a half hour to overnight; and meats such as beef or pork generally require at least one to two hours for the flavors to really develop. Always keep marinating foods refrigerated or iced, if outdoors. Get the meat ready: Let the pieces of meat be cool but not cold before grilling. This shortens cooking time and helps the food cook evenly. Don’t pierce the meat unnecessarily as juices will be lost. Get organized: Place all your ingredients and materials by the grill—meats, honey marinade, honey glaze, etc. Also, keep tools, like tongs for turning, nearby. Prepare the grill: Always start with a clean grill. Light your coals or turn on the gas 30 minutes prior to cooking; preheating between 350 and 400 degrees. Starting with a hot grill will help keep the honey-based marinades and sauces from sticking to the grill. This will also help make the clean-up easier. Finally, brushing the rack with oil before you place the food on it, also reduces sticking and produces grill marks like the ones you see in restaurants. Let it stand: Almost anything off the grill will taste better if you let it stand on the cutting board for a few minutes before serving. This allows the juices, which have been driven to the center of a roast or chicken by the heat, to return to the surface and give your meat a juicier flavor. Be Safe: Last but not least, remember to use long tools, never use gasoline to light your grill, and don’t wear aprons with long strings that could catch on fire. Next Spice Up Your Summer with a Salty Dog!